Key Elementary School, a sandy-colored brick building on a tree-lined street on Chicago’s West Side, sits empty now. Several windows near its entrance are boarded up, giving the school’s façade the look of a smile that is missing front teeth. The school is in a busy, historic section of the Austin neighborhood near a stately town hall inspired by the building where the Declaration of Independence was signed. In 2013, Mayor Rahm Emanuel closed Key and 49 more public schools—the most at one time in any school district in the nation—in an attempt to save money by shuttering schools with low enrollment. About 11,000 students, or 3 percent of the district, were forced to change schools. Emanuel said residents would have a say in turning the former schools into facilities that would benefit the surrounding neighborhoods. Yet four years later, two-thirds of the buildings are still vacant. There are no common standards for community involvement in determining their reuse. And aldermen, who until recently oversaw the process, have not held public meetings to discuss the future of about half of the schools, including Key. 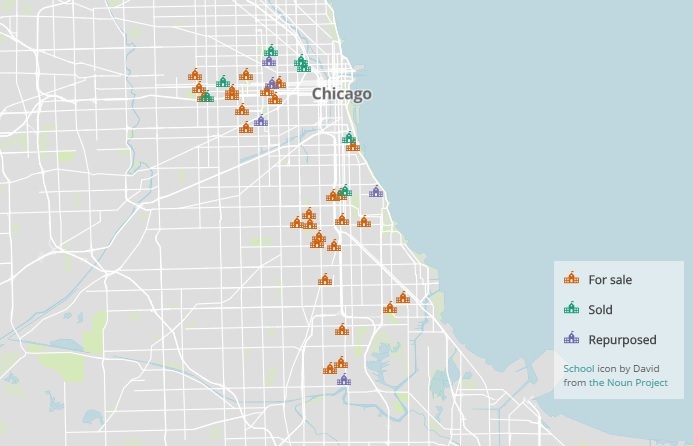 In response to a widely criticized and failing reuse plan, Chicago Public Schools put 28 vacant schools that were shuttered in 2013 on the market this week, taking decision-making about their future out of aldermen’s hands. The announcement came months after The Chicago Reporter began questioning CPS officials about the status of the repurposing. District spokesman Michael Passman said in a statement that the decision to expedite the sales was made to “accelerate the reuse and revitalization of former school sites and help spur new value from properties throughout the city.” School officials hope a mass sale will increase the number of offers, as the approach has in other cities. But residents, who have complained that they were denied a voice in the fate of their neighborhood schools, could have even less say under the new plan. Potential buyers cannot open charter schools and they will have to honor existing use restrictions established by residents, but moving forward, aldermen won’t have to hold public meetings about the sales of schools. CPS will negotiate with the top two bidders, part of its normal process, and consult with aldermen before finalizing sales. Community advocates criticized the decision, calling it a move by the school district to unload real estate for a profit at the expense of involving residents in finding quality uses for the closed schools. And they fear that changing the process only exacerbates the distrust and resentment generated by the school closures in the first place. From the beginning, educators, parents, community members and school experts warned that Emanuel’s plan for the schools was shortsighted and hit poor and African-American communities the hardest. Their fears have been borne out in the past four years. 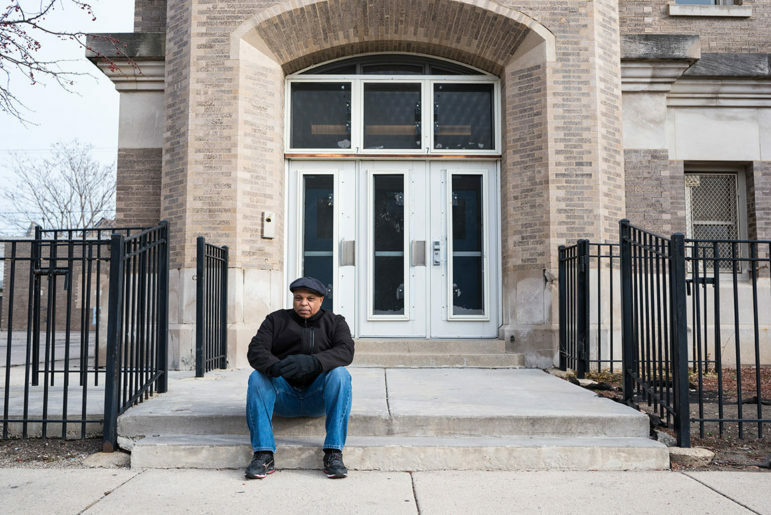 The remaining vacant schools are concentrated in poor, black neighborhoods on the city’s West and South sides, where a legacy of disinvestment and segregation led to enrollment declines, and eventually, the school closures. Chicago’s reuse proposal didn’t consider how to help these fragile pockets of the city. Aldermen and the district have focused on selling empty schools on the more affluent North Side or in gentrifying communities on the South and West sides. As a result, critics argue, they have squandered an unprecedented opportunity to link school reuse with community redevelopment in neighborhoods that could most benefit from investment. Click to see an interactive map tracking the sales and status of all the Chicago public schools closed in 2013. In fact, just the opposite is happening. Proceeds from the nine sold schools aren’t being invested in the communities where most of the closures occurred, which a special committee appointed by Emanuel had recommended. Instead, the district put the $24 million in proceeds from those sales into its capital fund, which Emanuel has used to build and expand schools that disproportionately serve white, middle-class families in a district where more than eight in 10 students are black or Latino and low-income. The schools are often in the city’s center and on the Northwest and Southwest sides. The school closure issue, like so many issues in Chicago, is rooted in racial segregation and its consequences. A new study released by the Great Cities Institute at the University of Illinois at Chicago that looked at school closures and turnarounds between 2000 and 2013 found that race, not simply enrollment or academic performance, was a recurring factor. Schools that were predominantly black and located within six miles of the city’s center, where there is more redevelopment potential, were more likely to be turned around or closed. Although the school district chose “race-neutral” metrics to justify the restructurings, the report argues that they interacted with “institutionalized racial inequities” and had outcomes that disproportionately affected black students. The history of Key Elementary illustrates the intersection of segregation, education, housing and economic opportunity. When Jacquenette Wright arrived at Key as an eighth-grader in 1969, she was one of five black students in a school of 550 pupils. With its far-west attendance boundary, Key was one of the few elementary schools in the Austin neighborhood that had yet to transition from all white to all black. Jacquenette Wright was one of five African-American students to attend Key Elementary in the Austin neighborhood in 1969, before the school went from nearly all white to all black. At the time, many black families were moving into Austin seeking quality schools and housing. Wright’s sister had recently bought a home in the neighborhood, and Wright used her address to gain entrance to Key, which offered a better education than the all-black neighborhood school to which she had been assigned. Encouraged by real estate agents, white families fled Austin, fearing the neighborhood would “turn black” and their property values would decrease. They sold their homes for cheap; speculators snapped them up, then resold them at inflated prices to black families. Businesses and factories fled Austin, too, in the wake of riots that damaged much of the West Side after the assassination of Martin Luther King Jr. in 1968. Within a few years, Key’s enrollment had skyrocketed to 800 students, most of whom were black. It wasn’t uncommon for the now predominantly black Austin schools to be overcrowded. CPS was slow to build additions and didn’t want to bus black students to white schools. One Austin school taught children for only a half day in two shifts so it could accommodate all students, even though CPS had eliminated the controversial practice, which was targeted in the city’s 1963 school boycott. Key remained overcrowded for decades. When Anna Baskin-Tines landed her first teaching job there in 1994, the school was “bursting at the seams.” The teachers’ lounge and a book closet were being used as classrooms. But by the mid-2000s, Key’s enrollment began to slip as the district added charter schools and other new schools designed to give families more educational options. And Austin continued to lose population due to disinvestment and lack of opportunity. In a little over a decade, Key’s enrollment fell by half. In the fall of 2012, Chicago Public Schools officials announced that low enrollment would primarily determine which schools would be closed. The district flagged nearly half the schools in the system as under-capacity. Community members said naming 330 schools was a deliberate move to inflate the number of schools at risk of closure to make the final decision seem less severe. Pointing to a decline in the city’s school-age population, school officials and the mayor’s office said the district had too much space for too few students. Taking buildings offline, they reasoned, would allow them to reinvest scarce resources into the cash-strapped school system. From the start, communities pushed back. They protested and packed public hearings about the closures. The “crisis,” parents and others said, was of the district’s own making, brought on by poor planning and the construction of too many schools as enrollment declined. If you are a parent whose child was affected by the 2013 school closures, share your story with us. The opposition was also fueled in large part by the district’s support of charter schools. People argued that even if some schools needed to be closed because they had too few students, charter expansion had exacerbated enrollment problems that officials were trying to fix at the expense of neighborhood schools. Rachel Weber, the lead author of the Great Cities Institute report on school closures, and a professor of urban planning and policy at the University of Illinois at Chicago, said while her study didn’t find a neighborhood school was more likely to close if a charter school was nearby, that doesn’t mean the spread of charters had no effect. 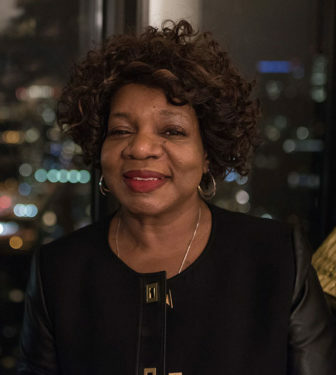 She believes the confluence of charter growth, the loss of public housing in African-American neighborhoods and the over-building of schools to keep students segregated led to “an over-supply of public educational facilities in some neighborhoods” that shaped closure decisions. In 2013, critics also said the criteria for closing schools were arbitrary and disproportionately affected black students. “To continue closing schools while cognizant of the havoc such reforms have reaped on African-American children is the embodiment of the most insidious type of racism,” said Bonita Robinson, a retired teacher who worked in Austin for decades, at a public hearing on the closure of Key. Emanuel said the closures would help African-American students, who were more likely to attend under-performing schools. “What does it say to any part of the city when you decide… that you’re going to leave kids locked in, trapped in a school that’s not succeeding?” he told the Chicago Tribune. The district formed a special commission to help evaluate which schools should be closed. The list was whittled down to 129, and then 54. In April 2013, many Key parents and teachers came to the final public hearing with a plea to keep the school open or merge it with the high school across the street. Parents, who’d formed their own safety patrol to protect Key, worried about the routes their children would walk to their new school, which took them past viaducts, gang territory and a halfway house for people with substance abuse and mental health issues. A month later, four schools were spared, but the school board voted to close Key and 49 other schools. 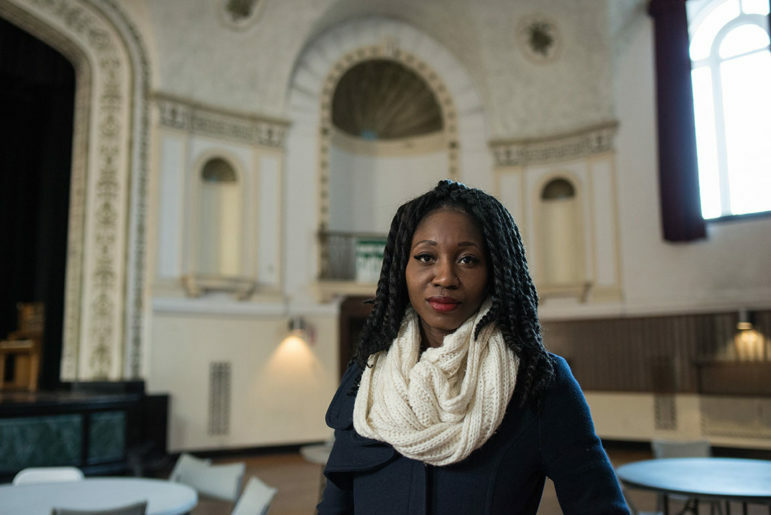 Amara Enyia says her plan for Key Elementary to become a home for start-ups was supported by several businesses who promised to relocate if the idea received funding. Other urban school districts have closed a significant number of schools in recent years, often entrusting the process to school officials or outside agencies. But in Chicago, management of the school repurposing quickly became politicized. Emanuel created a 14-person advisory committee, including three aldermen, to develop a reuse strategy. “Very strong voices” on the committee advocated that the City Council oversee the schools’ redevelopment, said Jim Capraro, a member of the advisory group. “The notion was that these were not going to be schools any longer and so therefore it didn’t make a whole lot of sense for [the school district] to run a public-review process,” said Capraro, who led the nonprofit Greater Southwest Development Corporation for decades. A year after the closing meetings began, a process was established whereby aldermen would conduct community meetings, decide when schools should go up for public bid and recommend a buyer. Community residents were to weigh in on ideas before decisions were finalized. In its report, the advisory committee recommended that buildings that didn’t sell after about a year or so be transferred to a third party with expertise in community redevelopment. Money from early school sales was to be put into a fund to help repurpose former schools in more challenging real-estate markets. But the school district ignored the advisory committee’s key recommendation to set up a fund from the early sales. The money could have funded feasibility studies, business plans or down payments. Instead the $24 million was put into the school district’s capital fund to pay for repairs, annexes and new schools in overcrowded areas, typically far from the poor communities that bore the brunt of the closures. Absent a clear, centralized process, aldermen took different approaches to community engagement and most left residents with little say in how their public schools were to be redeveloped. Public meetings were often poorly advertised on short notice. Proposals weren’t posted in one place, making it difficult to track progress across the city. And it was unclear to residents what aldermen had to do to satisfy the district’s community engagement requirements. Issues cropped up across the city, including in Austin, where Key Elementary is located. In the summer, Ald. Chris Taliaferro, of the 29th Ward, held a public meeting to get residents’ input about the future of two shuttered schools. Many residents expressed support for a workforce development center. Some even talked about drafting a proposal together. The alderman seemed open to the idea, but hinted that another group would soon make a presentation. A few weeks later, health and hospital executives unveiled plans for a wellness center. It was clear they’d had significant time to work through their concept, putting community residents at a disadvantage. The lack of transparency angered residents. Taliaferro never held a public meeting to discuss Key’s future. Enyia wants to turn Key into a home for start-up businesses and food truck vendors who would hold public tastings. The plan is linked to the development of an arts and culture campus around Key, which is near the historic Austin town hall, a public library and the Green Line. The idea, which could spur redevelopment around the school, has community buy-in, and Enyia says several businesses have promised to relocate if the proposal receives funding. Dwayne Truss, a member of the Austin Community Action Council, was active in school-repurposing discussions and feels the process would benefit from community input. The district decision to oversee school reuse doesn’t give residents much hope that equity and community development will be in the forefront of the process. Some advocates fear that planning efforts to fill the schools are being negated now that buyers have only two months to enter their bids. At the school board meeting later this month, Truss and others plan to demand a more transparent and community-driven process. Capraro, the former member of the mayor’s advisory committee, says if officials haven’t done the work to involve community residents in repurposing, the process is “kind of a sham.” More holistic planning is needed, he said, so schools are reused in a way that benefits the community, but also aligns with the neighborhood’s existing projects and goals. CPS should compile examples of repurposed schools from around the country to learn how others have done it, Capraro said. “Having some vision of what a successful project looks like is probably a really important thing,” he said. 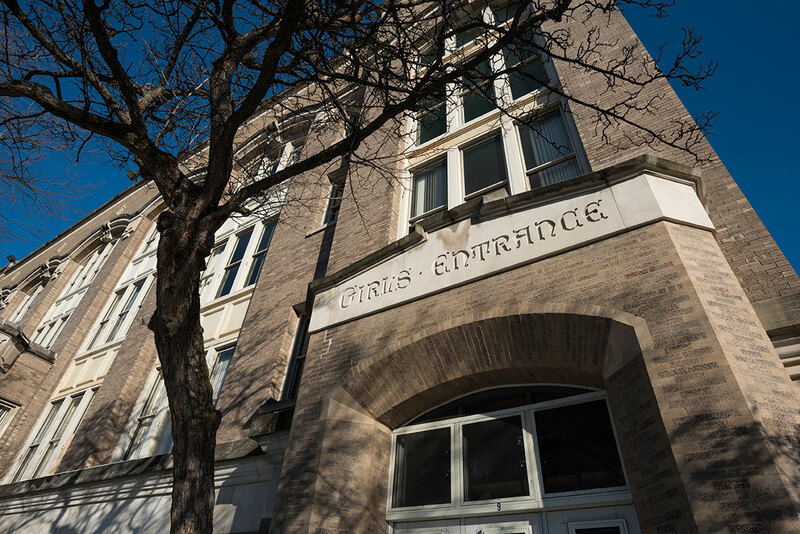 Experts across the country have praised Kansas City’s six-year-old school reuse strategy, which was highlighted by the mayor’s repurposing committee. The school district managed to reuse a significant number of empty schools in poor, black neighborhoods, and residents there say they’ve had a real voice in the process. Officials in Kansas City relied heavily on residents’ input at community meetings and school tours. Creative purchasing agreements allowed non-traditional buyers without much access to capital to take over empty schools. The initiative has influenced other cities such as St. Louis, which saw an uptick in school sales after implementing suggestions from Kansas City. Weber emphasizes that school closures “should be made only in worst-case scenarios.” City and school officials should find ways to maintain student populations and keep underutilized schools occupied. This is the first in a series of stories that examines the impact, four years later, of closing 50 Chicago public schools. If you are a parent whose child was affected by the closures, share your story with Kalyn at kbelsha@chicagoreporter.com. I’m very curious about what happened to Pope Elementary by 19th and Albany in the 24th ward. It has great potential for retail and condo use because of it’s proximity to the Pink Line, Albany Park Town homes, and Douglas Park but it’s completely vacant. decaying and razed schools. It didn’t have to be this way, Chicago is still one of the most segregated cities in the north! If you have another use then buy the building and use it. Oh, and is anyone surprised that this is happening in Rahmbo’s Regime? Thuggery brought to new heights in the City of Broad Shoulders. I used to enjoy Chicago. Now I stay away from a war zone. …give us resolution to solutions “Rainbow Push” and Oprah before continue decrying segregation where. Effort of community stop the closure of schools goal what? Charter for naïve “believing ideal curriculum students going,benefit inaccurate majority colleges USA. Margalized preference zip codes of “suburban K-12” which is,ideal example pretentious bigotry. Entitled where is solidarity among those,facing closure needed schools? Philadlephia,St.Louis,Yorkers,Cleveland,Arkon,Chicago, Miami and Pittsburgh attitude of regression. Doesn’t pertain to whom,next generation whom could benefit appropriate curriculum. Notice read about lower income Asians,Indians and Hispanics propaganda system is successful. Majority of middle class in USA rather pay students,private or charter schools yes segregation income and standards of educational institutions. When last time saw Asians students K-12,seldom only San Francisco,L.A and NYC majority have private tutors and schools. Mentality,social expectations lack of governmental knowledge cause the dismay of educational disparity in USA! Jay Z and Kanye any suggestion yeah?